Is this the same campaign where she chose to hop off the bus with her Asian co-star? Because if so, I was a fan of that ad! In the picture above though, they made her skin tone a very strange colour! The shade of pink doesn't help. 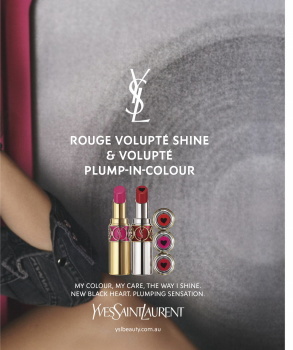 I own a few of the Rouge Volupté Shine and I really love the application and the colours. The only thing that I don't like is how expensive they are! She's actually quite good here. Very pretty. She's selling it. Much better than Stella McCartney and Fendi where I didn't find her convincing. I hope the inclusion of Kaia means a return to a more sultry look for YSL Beauty ads. And if ever there was a model who could promote the new high-coverage Touche Eclat and its supposed powers to hide dark circles, it's certainly this girl. interesting how these new creative directors arrive at fashion houses and update logos, fonts and even names while the cosmetics arm retains the old logos. Dior also has this problem. The old YSL logo makes it look like its from the 2000s. 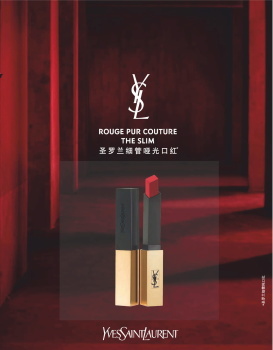 In this specific instance, YSL Beauté along with all the perfumes belong to L'oreal while the clothing line falls under Kering. It goes without saying that the beauty brand benefits a lot from the fashion one, despite the look not being similar. They're not even allowed to update it close to Saint Laurent because that may result in a lawsuit. The denim jacket, the leather wristlet, the celebrity-as-a-model pose, the whole looks too CoverGirl for me. tigerrouge, Aizanara, apple and 1 other person like this. I love the way it looks like she's smoking, because there's a sense of transgression about it, and for me, that's much more in keeping with the spirit of YSL.